It’s been a long wait but worth it. The quality is superb as I expected. The pages are a joy to look upon. Placing the cross-references at the bottom of the page and the use of engraved block capital letters at the beginning of each chapter is very eye-pleasing too. The space on the pages is pretty full yet doesn’t look crowded; a great layout! The maps are well drawn and use attractive colors. Another great feature is the glossary of archaic words if, peradventure, one comes across a word whose meaning is unknown or seems strange in the context. And personally, I am glad to see the trend of including the “Translators to the Reader” continued here. This is certainly one of the most beautiful editions of the KJV (my preferred version) available. All in all, a wonderful edition of the Bible and one I am glad to own and use! Absolutely stunning representation of The Word of God. 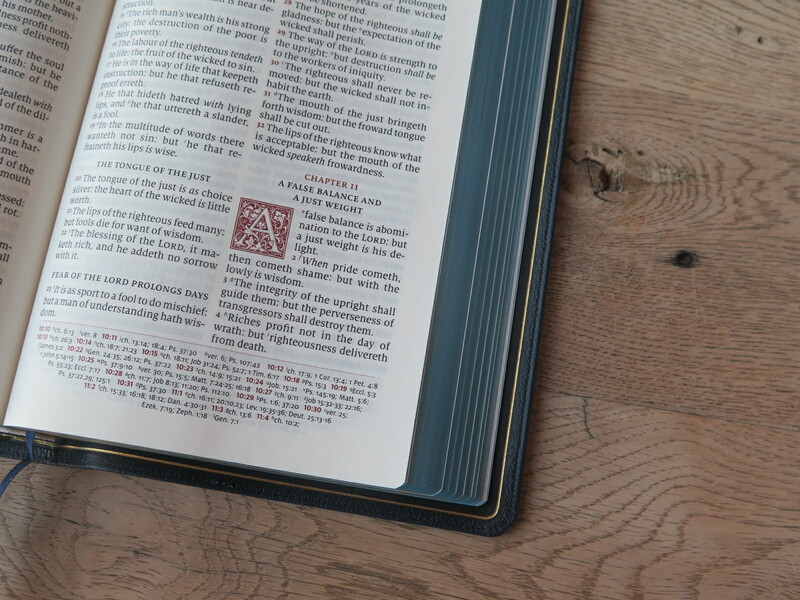 This Bible is top notch quality, lovely design, and easy to read layout. It arrived the day before Christmas Eve and was supposed to be a Christmas gift to myself. Hovever, I couldn’t wait and ripped the package open on the spot… so glad I did. This Bible is awesome! Very Beautiful Bible. 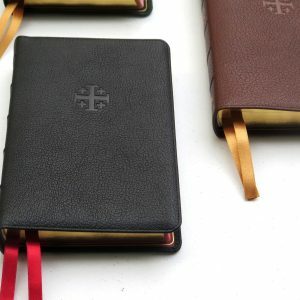 This is my first premium Bible and very nervous on spending what I did. I normally don’t read KJV but I couldn’t pass this Bible up. So glad I purchased this masterpiece. I’m growing more and more fond of the KJV every day. This is definitely the one I’ll be grabbing. Truthfully, I haven’t been able to put it down very much. God Bless! however The Translators to the Readers makes for very rich and historical reading. easier for me to handle as a book and more compact without losing the quality. The Goatskin Binding I liked for flexibility and softness as well as durability. Flawless! I Wish my ESV was done this well. The blue on the pages was never really dark enough. I just thought this was “normal” until the Cantebury came with its top notch blue pages. Lol. Neither of these are my main bibles as I prefer the NKJV and NASB. But this Cantebury is just unbelievable! This is unequivocally the finest and most artistic bible I now own. I have many fine bibles from Allan, Cambridge, and Schuyler, in different translations. If you are a KJV fan, this is a must have!! 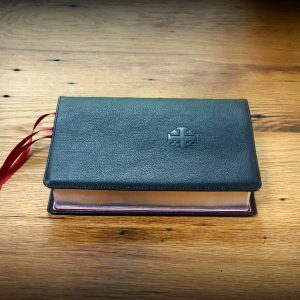 The feel of the Goatskin cover is exquisite, and does honor to God’s word. In the Navy Blue, my opinion, it’s the perfect complimentary color to the red verse numbers in the text. 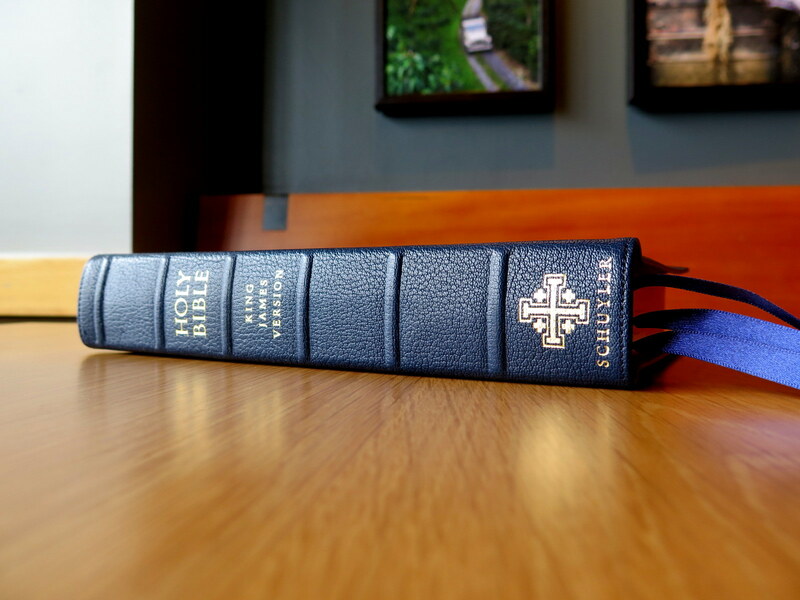 Also when opened, the blue lends a very calming and peaceful effect that adds to the calming effect of studying scripture. I also imagine it would assist in reading for longer periods as this subtle color produces less eye strain. The section headings is something I have always wanted as it gives an idea for each section within a chapter and helps the reader to focus on the message contained therein. It is also helpful in finding stories or certain parts of the story. The font is very readable in low light as I often read in the late hours to concentrate more easily, the children gone to bed and the cares of the day have been cared for. I have also found the ‘Glossary of Terms’ to be very useful to reference for words that aren’t commonly used as they were when the original work was produced. 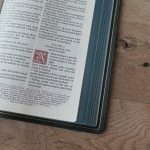 Oftentimes readers are dissuaded because of the vocabulary contained in the KJV. Admittedly, some sections are more difficult to understand, hence my ownership of different translations. I am always drawn back to the KJV, however, because the usage of language is poetic, beautiful and flows like poetry, to me anyway. In summation, I do own many fine bibles from the most renown publishers, but this is by far my favorite bible. With the other versions, there is always something that could be improved, to suit my taste anyway. This bible is a joy to own, to read, and to study from. 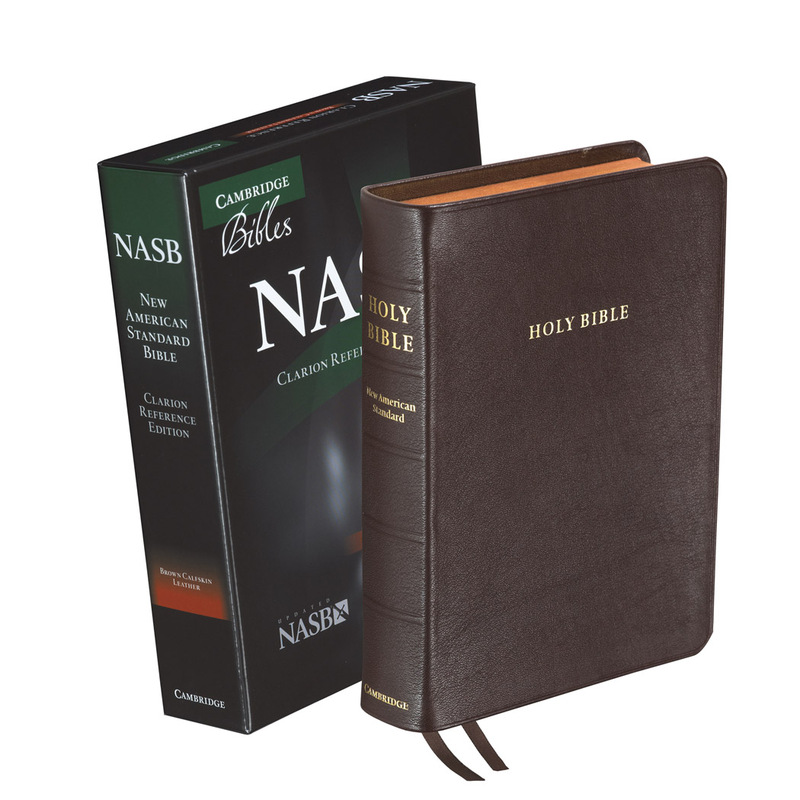 I’m quite sure that this is the last KJV bible I will ever purchase, as I’m sure with the quality in which it is produced, will last a lifetime and can easily be passed to my children for future generational blessings. This is not my 1st Schuyler Bible, but it’s the best I’ve owned!! I was a little worried the decorative drop caps would be a little showie for my taste, but i was wrong. Although they are large they are not bright or gaudy. There pail red. It’s nice because if they were a bright red it would be distracting. The Bible is a little heavy but not to thick. I do love this Bible. 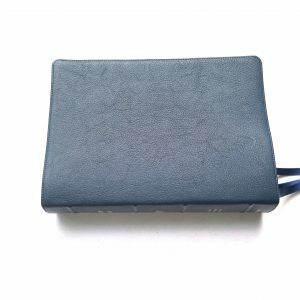 I was not a KJV fan until recently. Now it’s all I will read!! Thanks Evangelical Bible. Keep up the great work!! (You know you always get my business). After having some time to spend with my Imperial Blue Canterbury, I would have to concur with the previous reviews regarding the exemplary design. High on my personal list of “likes” are the inclusion of “translators to the reader”, as well as the brief, yet extremely informative “King’s English” glossary. 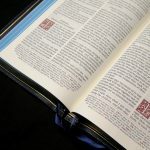 For the lover of the Holy Scriptures, the Psalms are never the same after they have been read in the paragraph format. My 50 or so year old bout with severe nearsightedness is well served by the font size and clarity, aided by the increase of readability provided by the absence of a center column for the references. I agree that the dark red used within the text block is perfect. It is an excellent balance of added color and flair for beauty and contrast. The shade complements the design by aiding the reader in finding verses and references without the harshness and glare that the use of a more vibrant hue would have incurred. The opacity and brightness of the paper win hands down over virtually every vintage copy that I have in my KJV (only) collection, which is approaching 80. This is especially apparent in less than ideal lighting conditions that I have encountered in hotel and motel rooms while traveling. I don’t know what I am going to do with some of the various used Cambridge Turquoise bibles I found on eBay, especially since that is now available new from CBP. That was my favorite text block prior to the Canterbury, only lacking a wide margin version for extensive note taking. I had also accumulated some leather for some custom rebinding jobs that may never come to fruition. The frailty of some older India papers makes for a dubious future for some of those plans. My greatest Canterbury dilemma was the choice of colour of the goatskin. I choose blue to match my first edition Allan 63 Sovereign NB S. Two purples are in my future as gifts for my older daughter, as well as my daughter-in-law. Someday I will get another colour for myself. Until then, I can immerse myself in the beauty of this masterpiece. 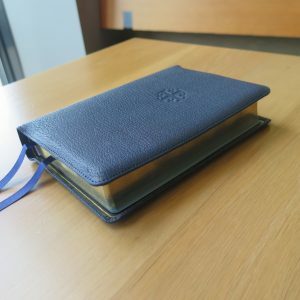 I have already lent it to a brother and sister in the Lord for a week, as an ambassador for the premium bible market. My standard response to those skeptical of the price of a well made bible is to ask what they paid for their choice of personal transportation, as well as inquire about the depreciation factor. I quickly move on from there, not expecting a response. I only bring that fact up to make my point, as we all have liberty in Christ. 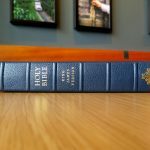 The pleasure of using a finely crafted bible is analogous to using a fishing reel that uses 17 ball bearings versus a department store special that has five, or a well made tool from the USA compared to an import that is cheap in both price and quality. Both might get the task completed, the difference is in the durability of the product, as well as the ease and joy of use. Time will tell on how well the leather wears and softens with use. I will leave the nitpicking comparisons to other bindings to others. My only wish would be for more lined paper in the back for notes. I really would not want a thicker text block, so possibly this could be done by reducing the number of heavy paper blank pages at the front and back, unless reducing them would somehow affect durability. It earns 5 stars from me without equivocation. 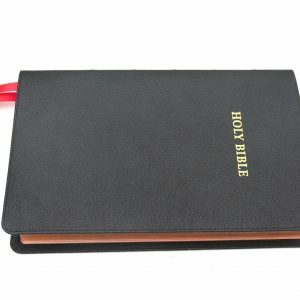 This is my first ‘premium’ made Bible, and I by no means am any kind of professional reviewer. I barely even understand and can truly appreciate the fine artistry and all the different methods used in creating something so finely-wrought. All I know and can say is, this Bible is absolutely beautiful, and I expect it will stay in my family for generations. God bless, and thank you so much. Highly recommended. 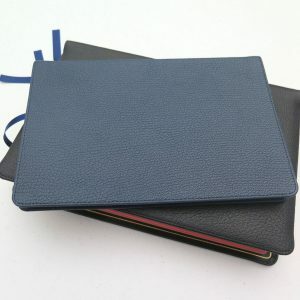 pre-ordered myself the Dark Purple Goatskin. 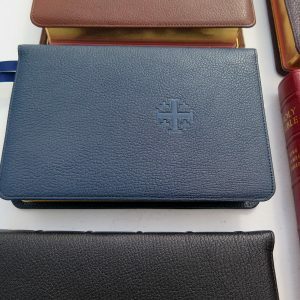 Afterwards I purchased the Green Calfskin, to have both leathers. Both are beautiful but I do prefer the Goatskin. I purchased this bible for the size of the text and the gold on blue art gilding. I am extremely pleased with the quality. 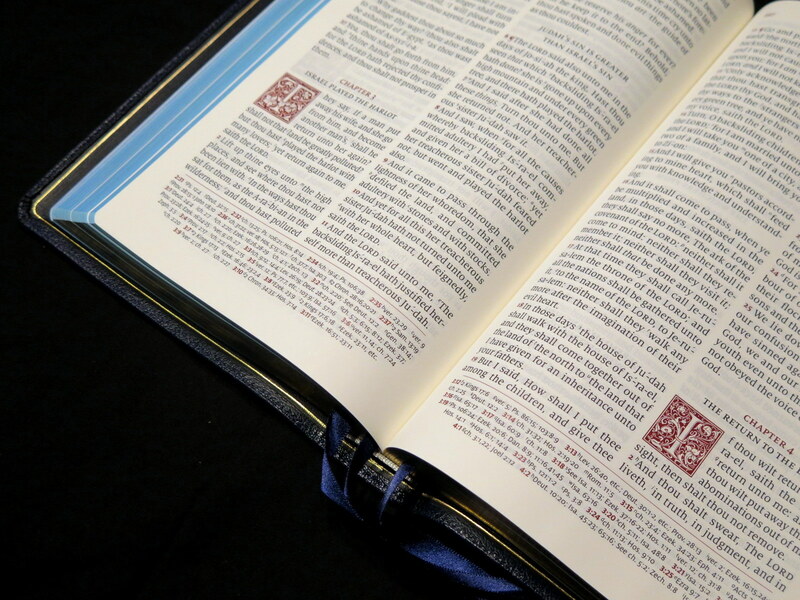 This bible is well constructed and is truly a work of art. 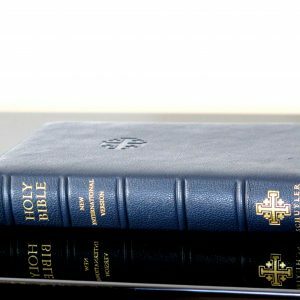 What matters is the word of god but the construction of this bible will last for years. Shipping was fast and without any issues. 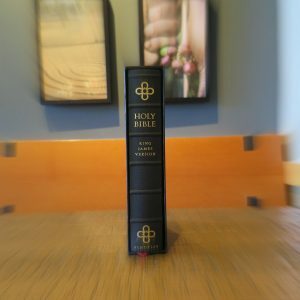 I recommend this bible to anyone looking for a easy to read text block and those wanting a bible that will last them for years. Thank you evangelical bible and Schuyler. 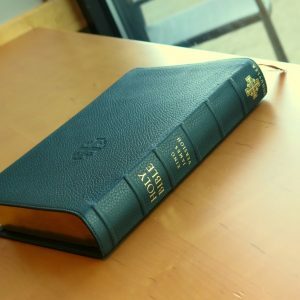 I just received my Canterbury KJV in the imperial blue color. it is beautiful work of art . I enjoy having the references at the bottom of the page of the page. It makes reading much easier. my only disappointment is with the art gilding, mine looks turqouise in stead of a deeper blue as shown on the internet. I know how colors can seam different online, I get that I just want to know if anyone else,s bible feels the same to them. 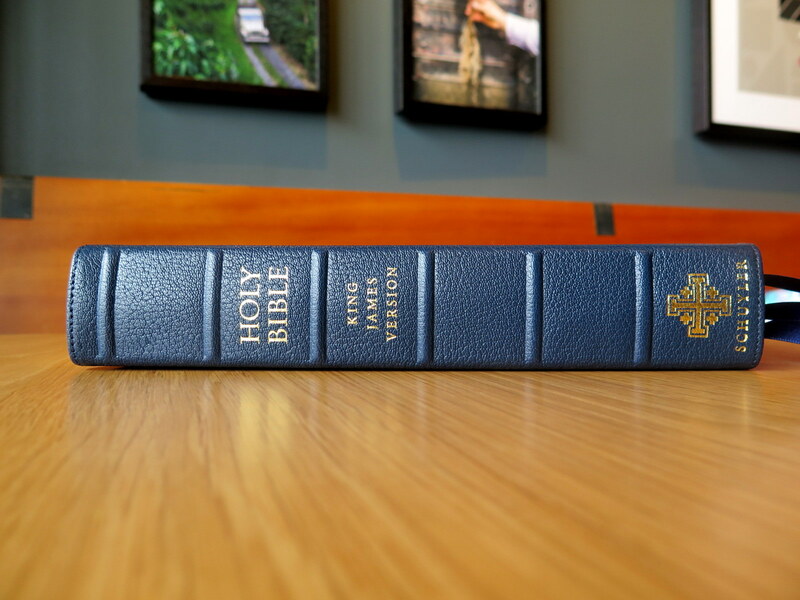 (Imperial Blue Canterbury KJV – Gold gilding with blue underneath is the same as mine. It just is not as blue as I thought it was depicted. I have already talked to a very courteous person from the company. What can I say? It’s the most you can do with a Bible. It’s just so very beautiful. There is not much I can add to the reviews that has not already been said. This bible is beyond beautiful. I love, love, love it! Mine is the imperial blue. If anyone is on the side line and not sure of this beautiful bible don’t be. Order it and you will not be sorry. I enjoy my quite time so much more. A young lady by the name of Sara helped me. She was absolutely the most gracious guide I could of asked for. I had many questions and her patience never wore out! Thank you, again Sweet Sara! 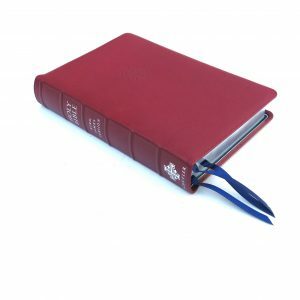 PS I also ordered the NKJV, in the purple… I wanted a red letter bible. It also is over the top! Love it! I have 3 Schuyler bibles and this is my favorite. The others are nice but there is something about the blue that I would not trade for any of the others. I could go on about the font and the red verse numbers and all of the other great things that others have already said but if you have any hesitations about getting one of these, don’t hesitate. You will not regret getting one.